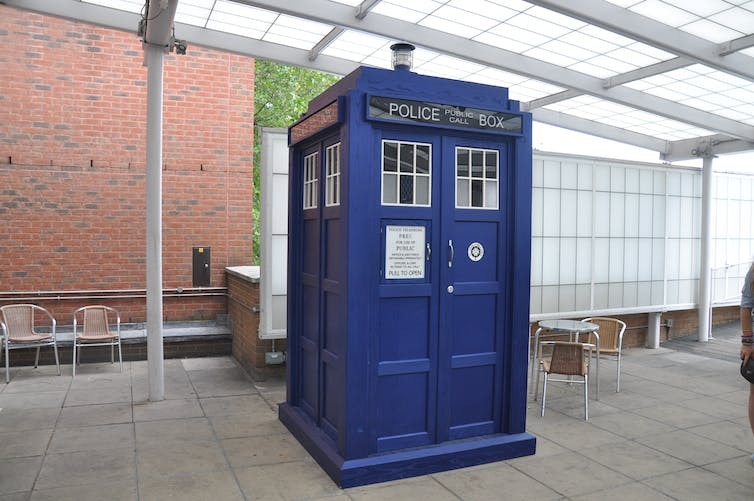 Given that in the show, the TARDIS tends to turn up only a few years or a decade or so off the intended target, a ballpark figure for the TARDIS’s precision in time is around one in 10100. So despite it seemingly looking a bit rubbish in the show from time to time, we’ve still got a long way to go before we can match it. There’s no denying that we’ve seen some absolutely staggering accomplishments in physics in the past year or so, particularly in our ability to measure space and time with unprecedented levels of detail. But being a lifelong “Whovian” excited about Doctor Who returning to our screens once again, I wondered how these accomplishments stacked up to those of the fictional Time Lords. The crowning achievement of the Doctor has to be the TARDIS, the blue box from the show that’s bigger on the inside and allows the Doctor and his companions to travel “all of time and space, everything that ever happened or ever will” as Matt Smith’s eleventh Doctor once put it. But throughout the history of the show, the Doctor’s TARDIS has shown itself to be rather unreliable, regularly turning up at the wrong place or time. Given these faults we might think that the TARDIS isn’t quite what it’s cracked up to be. While the show has featured many, often conflicting, descriptions of how the TARDIS works, the key to the Time Lords’ time travelling ability seems to be the “Eye of Harmony”, essentially a star in an eternal state of collapsing into a black hole. In terms of real science though, the same theory that predicted black holes – Einstein’s general relativity – has solutions which permit time travel (in fact one possible way of doing this has been given the name TARDIS). Whether nature actually allows such solutions to exist is still an open debate among theoretical physicists, and even if time travel could happen we certainly don’t know how to build a time machine. So we’ll just have to compare the Doctor’s TARDIS with our best instruments of simply measuring time and space. How good is the TARDIS? What we really need to compare here are these instruments’ relative precision. A simple way of thinking of this is as the ratio of the smallest thing you can measure with an instrument to the largest. In the case of a metre ruler that would be 1 millimetre compared to 1,000 millimetres (a metre), or simply one in 1,000. In terms of measuring space our best ruler by far is advanced Laser Interferometer Gravitational-Wave Observatory (LIGO). Gravitational waves are mysterious ripples in the fabric of space and time that travel across our universe at the speed of light – stretching space in one direction and shrinking it in the direction that is at right angles. LIGO was the experiment that last year directly detected the minute changes in distances travelled by light beams, caused by gravitational waves. These changes in distance are some 1,000-10,000 times smaller than the size of the nucleus of an atom, and they’re detected over a four-kilometre distance. That’s a level of sensitivity that’s up to one part in 1023 – a huge number consisting of a one with 23 zeros after it: 100,000,000,000,000,000,000,000. Now, considering the TARDIS’s playing field is “all of space”, it’s staggering that even when it turns up at the wrong place it simply manages to land on the right planet (usually Earth). The observable universe is some 1027 metres in diameter while the Earth’s is a comparatively tiny 1.3m metres. So simply being able to find our planet within only the observable universe is a feat requiring some one in 1070 relative precision. And that number only gets bigger when we consider how big the universe might extend beyond what’s actually visible. When it comes to time, scientists have been developing new atomic clocks which are much better than the old Caesium ones that have been used to define what a second is. All these new clocks essentially count the number of waves of specific colours of visible light emitted by atoms – a unique property of each element. Our current best clock uses Ytterbium atoms and is stable enough to yield relative precision a little less than one in 1018. But how do you compare this to the TARDIS? As it covers everything that ever happened or ever will happen, we need to essentially find out when the universe will die to be able to make a comparison. It’s currently 13.8 billion-years-old, but that’s still a very long way ahead. Given our current understanding of the amount of matter and energy in the universe, it won’t be until some 10100 years that all of the stars, planets and galaxies will have died, all protons and neutrons will have decayed and even all the supermassive black holes will have evaporated. This is what is known as the heat death of the universe. Given that in the show, the TARDIS tends to turn up only a few years or a decade or so off the intended target, a ballpark figure for the TARDIS’s precision in time is around one in 10100. So despite it seemingly looking a bit rubbish in the show from time to time, we’ve still got a long way to go before we can match it. This is certainly something I’ll be keeping in mind when watching the show.